There is always something going on at Victoria as we are such a progressive centre. If you would like to get involved in fundraising or make a donation, please contact our Fundraising Department at our National Office. 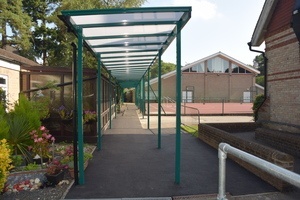 We have recently raised funds to build a covered way from the Main School to Carmel House. This project cost approximately £75,000. Not only does this link our site together, providing an integrated feel, it also improves the experience of students, staff and visitors as they travel around our centre. Thanks for all your support.